The Soyuz TMA-14M spacecraft carrying Russian cosmonauts Alexander Samokutyaev and Elena Serova (Roscosmos) and US astronaut Barry Wilmore (NASA) successfully landed in Kazakhstan after departing from the International Space Station (ISS) on Wednesday. Serova was the first Russian female cosmonaut to work aboard a space station in 20 years. The landing of the Soyuz craft was broadcast live by Roscosmos and NASA, with viewers reporting on each stage of the crew’s journey to Earth on Twitter. 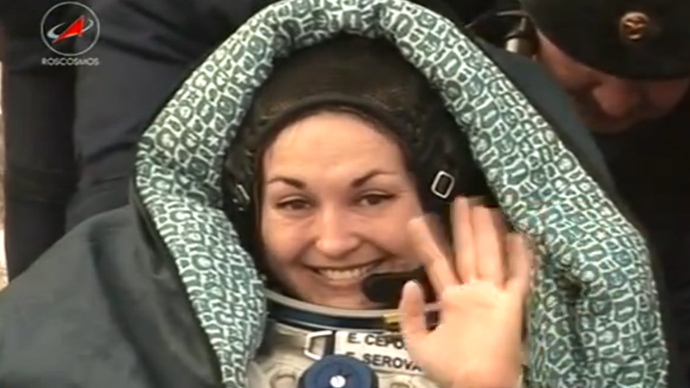 There was some excitement during the unloading of the crew from the capsule, which took about 20 minutes, but the astronauts emerged in good health – including the smiling and waving Serova, who was brought out last. Samokutyaev told journalists immediately after landing that the trip was fine, and that he believes he had a rougher Soyuz landing previously. “Everything is fine. I am drinking real tea with lemon,” he said, smiling. “Everything is great, thank you. The guys are great and worked very well,” Serova said as one of the doctors was checking her pulse and blood pressure. The three crew members have worked on the ISS for around 170 days. Another three members of the crew remained aboard the station, which is located 260 miles (418 km) above Earth. Mission commander Terry Virts (NASA) along with Anton Shkaplerov (Roscosmos) and Samatha Cristoforetti (ESA) are due to return in mid-May, while astronaut Mark Kelly and cosmonaut Mikhail Kornienko are due to launch on March 27 and spend a full year aboard the ISS. Currently, all manned missions to the ISS are launched from Baikonur Cosmodrome in Kazakhstan, using Soyuz spacecraft originally designed in the 1960s for the Soviet lunar program. At least one Soyuz is docked to the ISS at all times, for use as an escape craft in the event of an emergency. The Soyuz rocket is the most frequently used and most reliable space launch vehicle in the world to date. 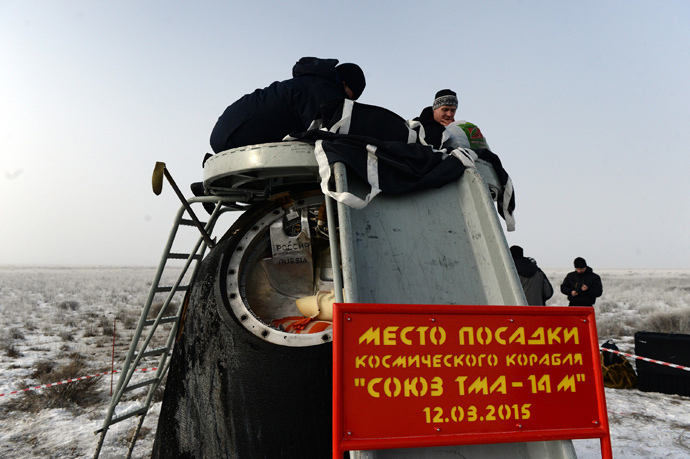 Soyuz TMA-M, in service today, is the fourth generation of the spacecraft. A new and final version of the system is planned to enter service in 2016. A successor to Soyuz, the 'Prospective Piloted Transport System' (PPTS) is in development by the Russian space agency Roscosmos.